It's a matter of a couple of weeks before Avengers: Endgame hits the screens. One of the most awaited superhero movies of all time, the sequel to Infinity War is already busy making new records and is expected to create havoc at the box office. With the release of some new trailers and TV spots, it's evident that Iron Man aka Tony Stark aka Robert Downey Jr is back from space with a determined mind to beat the Mad Titan. And before we get to see its final cut and some awe-inspiring moments, it's time to see these characters shine in these new magazine covers. Marvel Streams 10 Minutes of Avengers Endgame Footage, Russo Brothers’ Film’s New Set of Spoilers Hits the Internet. 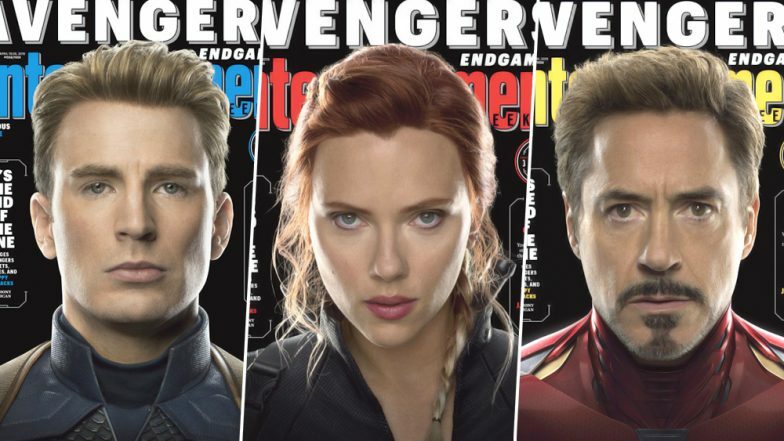 From Iron Man to Captain America, Thor, Black Widow, Hawkeye and Hulk getting individual covers, we wonder if the focus was always on the 'Avengers.' Though we are loaded with some sense of euphoria currently, fans of this franchise are busy finding clues and reading between the lines. From 'It's the end of the Line' that hints about deaths of these characters to noticing six infinity stones that are dedicated to six Avengers on their individual mag covers, fans are wondering if the makers are dropping any crucial clues. Yes, it may be an exaggeration but only time can help us solve this mystery. Till then go ahead and check some of the most curious tweets. First on LatestLY! Avengers EndGame Director Joe Russo Reveals How Rajinikanth's Enthiran Almost Inspired The Climax of Age of Ultron. Wait!!! Does this mean that each avenger gets to wield and use the stone used to mark his issue ??????!!!!!!! Oh Snap!!! (no pun intended) Each cover have an infinity stone highlighted for each character. I love it!! Avengers: Endgame is all set to hit the screens on April 26, 2019, and its advance booking has already beaten the likes of Star Wars: The Force Awakens and The Last Jedi. Is Captain America bidding adieu to this universe with this new release? We'll wait for Russo brothers to answer that.